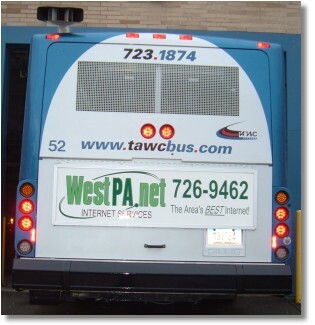 ADVERTISE ON OUR FIXED-ROUTE BUSES! Drivers side & Passenger side 30" x 88" = 2,640sq in. x $.05 sq. in. / month=$132/month x 12 months = $1,584/year. 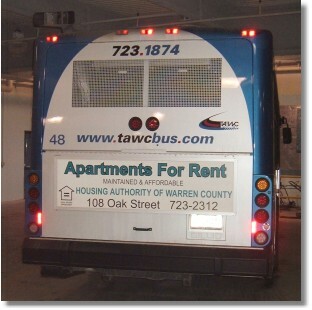 Rear of Bus 21" x 72" = 1512 sq. in. x $.05 sq. in. / month = $75.60/month x 12 months = $907.20/year. 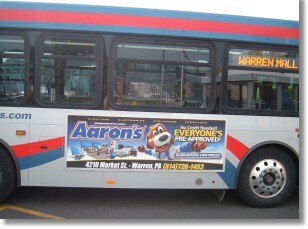 Advertising is also available on the Shared-Ride buses. Call Judy at (814) 723-1874 for more information. 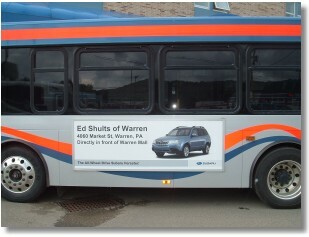 Tell Judy you saw this add on our Website and receive 20% off. All signs are pending availability.